2 x 18W Hi-Fi Stereo Power Amplifier based around two TDA2030 ICs. It has good input sensitivity, low distortion, good operating stability and full protection against overloads and output short-circuits. It can be used as a booster amplifier for existing small systems or to drive a second pair of speakers besides the ones already connected to the system. 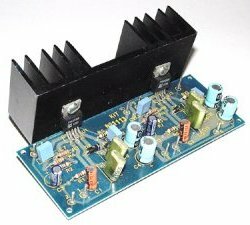 The board needs a symmetrical power supply of ±18Vdc/3A and can be connected to loads of 8 or 4 Ohm. Large heat sink is required for this circuit. Diagram shown below indicates only left channel. Make two circuits for for stereo version. Make sure that all the polarized components have been soldered the right way round.